I did it! I finally switched over to the new blogger. So far so good. Breakfast and lunch today were not very exciting. Amelia had oatmeal, applesauce and bananas for breakfast and the second meal of the day was toast with peanut butter, pear yogurt and some peaches and carrots. But we are making something new today, fruit leather. I have a couple of books that tell how to make baby food. I made almost all of Amelia's baby food, not only because they tend to put unnecessary junk in jarred baby food, but also because it was so much cheaper. The price difference is amazing. And it was actually really simple. Anyway, I have rediscovered these two books since I quit working. They have great recipes for toddler and adult food as well. I've been trying out different recipes here and there. The project today was strawberry and applesauce fruit leather. The only problem, is I am THE MOST inpatient person in the world. 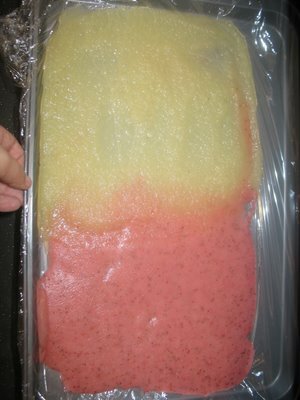 The fruit leather is supposed cook for 1-2 days. And I'm only supposed to open the oven every few hours to check on the progress and let the moisture out. That's going to make me crazy over the course of the day, since I don't even have a working over light so I can peer in on it. Here's what it looked like when we first put it in the oven.